In everything we do, the flowing rhythms of our human spirit are the power behind our engagements with the world. Our actions are outward and visible signs of the motive spirit that drives us from within. This slim book is about the crucial role of that spirit as expressed in the loops of engagement by which we reach out to our surroundings and they reach in to us, so providing the critical balance between our restless perspectives and the landscapes we depend on in being ourselves. 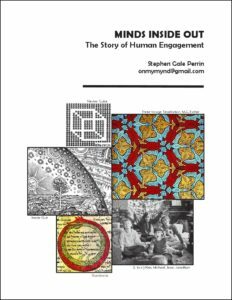 It all began ten years ago with Perrin’s first draft of a diagram he made of his own mind. He is a visual animal, so thinks of his inner life in graphic terms. That diagram has grown clearer over the years, and now serves as an outline for the text that goes with it in providing a template for seekers to know themselves through their successive loops of engagement. As he sees it, people adopt an interrogative stance in facing each moment as it comes. Perception wants to know What’s happening? Situations ask What do those happenings mean in personal terms? Judgment reviews our options for making a fitting response. Action commits us to the most appropriate choice we can make. Intelligence, in turn, asks at each round of engagement, How am I doing? So it goes, our security, survival, and well-being depending at each round on how attentive we are to our streams of engagement. The purpose of consciousness, Perrin says, is to enable us to make appropriate responses to situations we find, believe, or imagine ourselves to be in. Intelligence guides us in integrating perception, judgment, and action in each pressing situation as it engulfs us. Who is Steve Perrin whose spirit drives him to assemble these words and images at the end of his life? He calls himself a wayfarer or pilgrim on a mission to know himself before he dies so he does not have to peer into the mirror at a man leading an unexamined life, which to him would be irresponsible to the cosmic order that charges us all to play our bit parts. Perrin has chosen the role of a mindfarer driven from his earliest years to understand himself in the context of the interaction between his inner and outer worlds. In that, he has been a lifelong learner, asking questions to clarify each situation he has been in. He has pursued formal education at Massachusetts Institute of Technology, Columbia College (B.A. ), and Boston University (Ed.D. in Humanistic and Behavioral Studies, 1982). He has taught poetry on every level of public school; humanities, art, English, and photography on the secondary level; and given numerous talks on estuary values, functioning, and wildlife to adult audiences in the past thirty-five years. He has written four books about Mount Desert Island where he lives, two self-published books about consciousness, and now this terse narrative of his journey as but one mote in the cosmos.